Sip your way to a healthy weight by adding green tea to your daily, balanced diet. Green tea is made from the same plant as other tea varieties. However, it contains higher levels of antioxidants because it is produced by drying the leaf, while black teas are fermented leaves. Although there is debate on whether the natural caffeine content of green tea increases fat burning, the high antioxidant content of green tea may help hasten weight loss by generating heat. Hence, decaffeinated green tea likely will have a similar effect on your weight. Green tea contains high doses of antioxidant compounds called catechins that have been linked to heart health, weight loss and other benefits. Research published in 2006 in the "Journal of Medicinal Food" reports that weight loss due to thermogenesis -- inducing fat breakdown by generating heat in the body -- is primarily linked to the catechin epigallocatechin gallate, abbreviated as EGCG. Decaffeinating green tea may slightly reduce its catechin content, but it will still contain adequate amounts of EGCG. 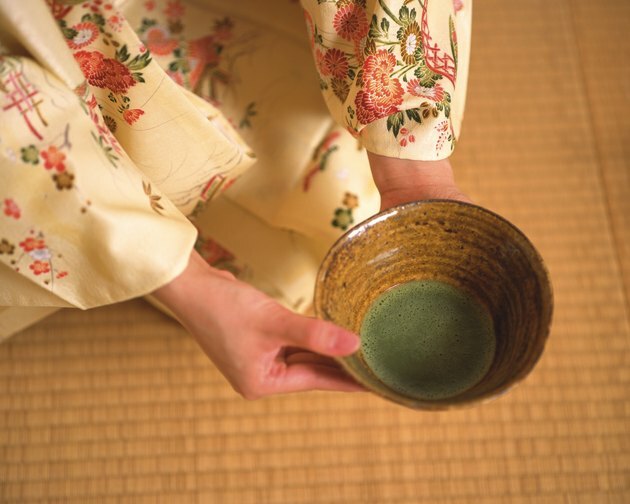 Drugs.com recommends drinking 3 to 5 cups -- 1,200 milliliters -- of green tea per day. While drinking green tea as a beverage is safe, some individuals may experience headache pain, dizziness or digestive upset. Additionally, like other types of tea, it can hinder how your body absorbs iron and folate. Green tea also contains vitamin K, which increases blood clotting and may interact with some anti-clotting medications. If you are taking any type of medication, ask your doctor or pharmacist if it might adversely interact with green tea and other foods. Capsules that contain green tea extract for weight loss usually contain concentrated doses of EGCG. This antioxidant compound is also available on its own in capsule form, suggesting that it is the primary ingredient in green tea for weight loss. Drugs.com notes that a daily dose of 800 milligrams of EGCG per day for up to four weeks has been shown to be safe in studies. Excess amounts may lead to toxicity in the liver. To reduce the risk of side effects, take any type of green tea extract supplement with food. Consult your doctor before taking green tea or other herbal extracts for weight loss. The potent antioxidants in green tea include EGCG, epigallocatechin and epicatechin. A review published in 2001 in the journal "Cancer Epidemiology Biomarkers and Prevention" notes that all of the catechin compounds contain health properties other than stimulating fat-burning and weight loss. These include antioxidant activity that may help reduce your risk for certain cancers and lower high cholesterol levels. However, further clinical studies are needed to confirm these benefits. Will Green Tea Before a Workout Burn More Fat?